Geology tells us that the Bay of Fundy was formed millions of years ago, after the continental shift and in the wake of the glaciers. A natural funnel was created, setting the stage for the highest tides on earth. Today it's the connecting waterway between the Eastern Canadian provinces of Nova Scotia and New Brunswick. Something truly amazing is happening in the Bay of Fundy. Here the tides are so extraordinary, they have earned the reputation as a world-renowned natural phenomenon. 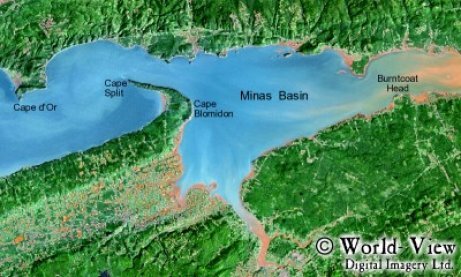 The highest tides on earthfill the Bay with over one hundred billion tons of seawater. Waters as high as a four-storey building brimming with diverse marine life. Only hours later, you can walk on the seabed at low tide. What makes this ecological wonder so unique is that it happens twice a day, everyday. In Nova Scotia, the highest tides on earth occur at Burntcoat Head in the Minas Basin. It is said that the province actually bends under the weight. You can discover scenic vistas like the lighhouse at Cape d'Or. Or visit over 800 festivals and events showcasing everything from Celtic heritage to the best living history in Canada. Take on the fast pace of tidal bore rafting or take it easy on the many charming and challenging golf courses. And no trip to Nova Scotia would be complete without trying the seafood. Dockside restaurants boast lobster fresh off the pier and make sure you try the Digby scallops. The highest tides are full of life as the Bay of Fundy welcomes a variety of whales - humpback whales, fin whale and minkes are common place, yet, the rare right whale is one of the most exciting visitors. Close to extinction, it's estimated that there are only 350 of this species left in the world. You can learn more about diverse whale species at our compelling museums. 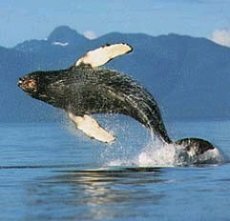 Or see live whales that migrate here to the Bay of Fundy. It's an amazing sight to see. It's what fills the whale-watching tours, where the whales are always treated respectfully and in accordance with the strict code of ethics drafted and signed by tour operators in the Bay of Fundy. Whales are only some of the many guests thriving in Fundy's powerful tides. All around the Bay of Fundy, you'll be greeted by an impressive show of shorebirds flocking and reeling off endless beaches. Take eco-tours through delicate mudflats and dunes to witness Fundy's multitude of marine and organic residents. Discover the ancient imprints of the Bay's former tenants. The Fundy shoreline is home to a variety of protected fossils and semi-precious stones. In places like Joggins, Nova Scotia, the fossil-rich cliffs attract geologists from around the world. As the highest tides on earth pour into the Bay of Fundy, it brings an excitement that takes over. Take part in the adventure. Try tidal bore rafting on the Shubenacadie River in Nova Scotia where the tides actually reverse the flow of the river. Along every coastline, you can go rock-hounding at low tide. From hiking trails to scenic drives, from powerboat tours to canoeing, the Bay of Fundy is alive with excitement. And there are great places to stay in the Bay. We offer everything from world-class hotels and resorts to cozy B & Bs and country inns. Enjoy fresh Digby scallops, lobster and crabs, while shopping through historic markets or local boutiques. The Tidal Bay Eco-zone includes the fringe of shoreline surrounding Cobequid Bay and the south edge of the Minas Basin. Low sandstone cliffs rim the shoreline. At high tide the Bay brims full, an uninterrupted expanse of saltwater more than 10 kilometres wide. The low tide exposes vast expanses of sand and mud. In the upper reaches (between Maitland and Great Village), the exposed sea-bottom is reduced to innumerable interlacing channels. The water temperature in Cobequid Bay, unlike outer parts of the Minas Basin, can become quite warm and may reach 20 to 25 degrees Celsius in mid-summer. 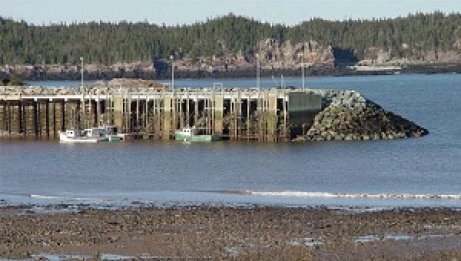 The highest recorded tides in the world have been measured at the entrance to Cobequid Bay. At Burncoat Head, the tidal range has reached 16.5 meters. At Economy Point, a range of 16.4 meters has been recorded. The in-rushing tide creates tidal bores as it floods up the rivers which drain into the Bay. One of the most popular sites for viewing a tidal bore is on the Salmon River near Truro. Each day during the summer, crowds of observers watch the tide churn upstream, temporarily reversing the flow of the river. Drawn by the rich waters flowing from the Bay of Fundy and the resulting abundance of phytoplankton and fish in the area, the whales — such as humpback, minke, sei, and the rare right whale — come to feed and court. Recognizing the vital role the waters around Grand Manan Island play in the life cycle of the endangered right whale, the Canadian government established a seasonal Conservation Area from June to October each year. The areas around Grand Manan and nearby Roseway Basin are the only known locations where right whales can be observed in the summer and fall, according to reports.